Interviewing potential sitters to care for your pup can be daunting. With many sitters available, finding the perfect person for your furry loved one is tough! Fortunately, there are some key questions you can ask potential candidates to ensure you hire the ideal sitter. A higher level of experience, especially if your dog has behavioral or medical concerns, means your sitter has probably worked with pups similar to yours and can handle their specific needs. 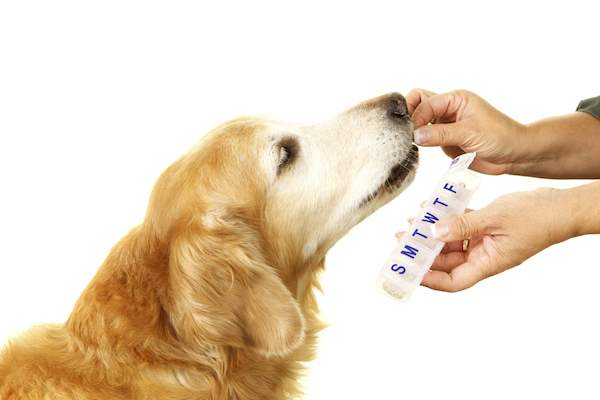 Dog getting medication by Shutterstock. 2. Will you be comfortable caring for my dog? If your pup does have special needs, ask if the sitter is comfortable caring for your dog. You want to ensure your sitter can administer medication, handle behavioral issues, or take your energetic 100-pound Labrador for a walk without issues. 3. Are you CPR/Pet First Aid Certified? While these certifications aren’t mandatory, it shows an extra level of conscientiousness if a sitter takes the time to get certified in CPR or pet first aid. Ask for and call references or use a site like Sitting for a Cause to find sitters who have reviews you can read in order to ensure you hire a sitter with a good track record. 5. What do you charge and what is included? Many sitters charge a base price then add charges for additional services, so make sure you fully understand what you will be charged and the care your dog will receive. 6. How many other clients do you work with at once? Most sitters will work with other clients while they are caring for your dog. Make sure your sitter doesn’t take on too many clients at once so your pup isn’t shortchanged on care. 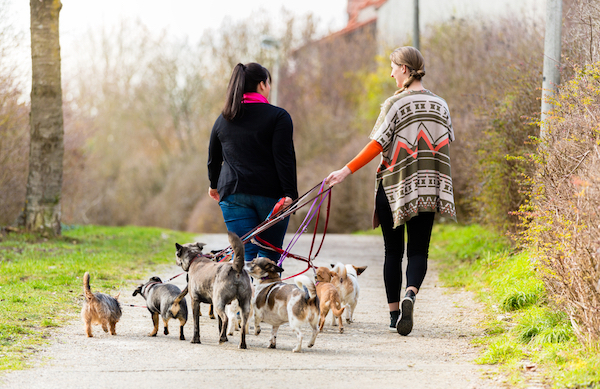 Pet sitters walking dogs by Shutterstock. 7. Will my dog be around other pets? Find out if your sitter will allow your dog to be around other pets. If you aren’t comfortable with your pup being around other animals, make sure your sitter can abide by your wishes. 8. How do you handle emergencies with pets? Accidents can happen! Find a sitter who knows to get your pup to a veterinarian quickly, will keep you informed, and requests a veterinary release. 9. Can you care for my dog longer if I encounter travel delays? Ask if your sitter can provide care longer than anticipated if your arrival is delayed. You don’t want to get stranded by a blizzard and have no one to take care of your pup until you can get home! 10. Will you send me updates? Most sitters are happy to help alleviate your separation anxiety by sending you pictures or videos of your furry loved, so ask if your sitter will send you daily updates! If a prospective sitter answers these questions in a way that makes you confident that they can take awesome care of your pup, chances are they are a good fit! Schedule a meet-and-greet before hiring, though, to ensure they are a match made in heaven for your pup. If they are, you can travel stress-free knowing your dog is receiving great care! About the author: Ashley Jacobs is the founder and CEO of Sitting for a Cause, a pet sitting website that donates 50 percent of its profits to animal-related causes. She is passionate about helping animals in need and resides in Newport Beach with her 8-year-old Golden Retriever, Diamond. The post 10 Questions to Ask of Any Potential Pet Sitter appeared first on Dogster.